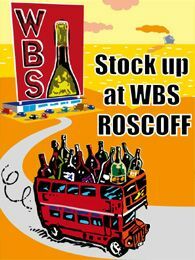 OPENING OF A WBS TWIN OUTLET!! ROSCOFF...3 MINUTES DRIVE FROM THE FERRY TERMINAL - DON'T MISS THE RED BUS! >>> Olivier Lacour wines : from €3.29 per bottle ! BARGAINS FOR THE SPRING !! When leaving the ferry terminal follow the direction of Morlaix. A three minute drive will get you to the SECOND ROUNDABOUT. We are located on your RIGHT HAND SIDE and there is a RED DOUBLE DECKER BUS on our parking place...Looking forward to seeing you !